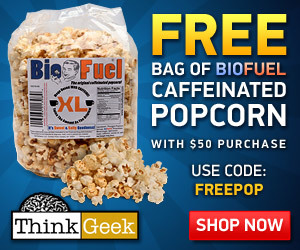 Think Geek have just released another promotion, a free bag of Caffeinated Popcorn with all orders over $50, use code ‘FREEPOP’ at the checkout. You’ll need to be quick though as there are limited quantites and you need to order by Dec 23 – 12pm EST to get your gifts in time for Christmas. Head on over to Think Geek now. Wow, caffeine in popcorn, too? I already drink 4 to 6 cups of coffee every day. Add some popcorn and I may never sleep again!